From Asia's Korean Chess, we move to Circular Chess, a distinctly European chess variant. Circular Chess is just like standard Western Chess. Same pieces, same powers, and but for a few minor alterations, the same rules. There is however one little thing that makes it an altogether different discipline from Western Chess. The battle takes place on a board that could not be more different from the traditional 8x8 square board. The board is still checkered but the similarities end there. This game is played on a circular board like an athletics track. There are four lanes, not eight, and each of these lanes contain sixteen squares. It's just as if someone got a regular square chess board and ripped it in half, the kingside from the queenside. Then if they would have stuck the Black kingside home rank to the Black queenside home rank so that they would have a board with 4 rows of 16 squares. And then finally if they would have bent the board into a circular hoop. And then joined together the White kingside home rank and the White queenside home rank, at the two ends of the 16x4 board. They would now finish up with a Circular Chess game board. Evidence of this game was discovered in the 1980s by David Reynolds, a historian from Lincoln, England. He saw a picture of the game board and pieces in a book and was fascinated by it. He did not have anything on the rules of the game so he simply applied the standard Western chess rules. David made a cardboard Circular Chess board and took the pieces of a standard 8x8 chess set. He brought his new game down to his local pub to play with his friends. They found the game to be perfectly playable and most enjoyable. The new variant grew from there, with the number of registered players steadily increasing. They even have a World Championship which is played in Lincoln. More has since been discovered on this variant over the 30 years since David Reynolds breathed new life into it. The original rules have been uncovered. The game was originally played with the rules of Shatranj as it originated in Persia around 1,000 AD. It is sometimes called Byzantine Chess even though it can't be conclusively linked with Byzantium. Byzantine Chess was played with the Shatranj pieces and rules in medieval times. The king and counselor (in Shatranj there was no queen) were set up on the inner ring straddling the back line dividing the home rank. The elephants (instead of bishops) were on the second ring. The horses were outside them on the third ring. The rooks were on the outside ring. Four pawns were placed in the rank in front of the pieces on both sides. The king from one side would always face the enemy counselor. Apart from the changed game board the rules were as the were in Shatranj. The modern day Circular Chess, the descendant of Byzantine Chess is played with the rules of the modern descendant of Shatranj, our Western Chess. A few little things haven't survived like castling as the circular board has rendered it pointless. The en passant rule which apparently David Reynolds did not like is another casualty. The kings face each other in this game. 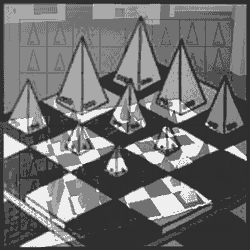 Pawns promote when they reach the enemy back rank six squares from their starting positions. Back row pieces can disregard the back line and move around the circle in any direction. Queens and rooks can travel all the way around an empty ring stopping on any square apart from the one they started on as this would be a null move. The game is based on the standard chess rules, same pieces, same powers. And yet the circular game board throws all of the hard learned positional realities of the 8x8 square board out the window. The circular board has it's own ruthless logic, it's own unswerving realities but you have to forget everything you know and start the learning process all over again. The development of circular strategic theory in still in it's infancy. It does not have the centuries of honing that standard chess does. But since we're in the technological age, it should catch up fast. When it becomes big enough, someone will decide that it's commercially viable to develop software programs and engines to work out the best moves. Until then the humans are on their own. You can't play this game in your browser on the web as yet. You can however download the game from some online vendors. It's free to try so if you don't like, don't buy. Circular Chess is yet another example of just how fluid and adaptable the entire chess concept is. It can be manipulated in so many ways. A simple change to the board design can preserve the conceptual integrity yet utterly change the nature of the battle in the same fell swoop. Pieces can retain the exact same powers but the measure of those very powers themselves can fluctuate absolutely when applied to a changed fighting arena. Fundamental concepts like blockading and all of the little things you always did to try to force that breakthrough can be rendered practically meaningless in an instant. Just as quickly new themes and playing patterns, unseen and obsolete on a square board come to the fore on the circular. We'll be going back to our trusty 8x8 board for our next variant. But don't be thinking that will make things look at all familiar. In this game, the traditional chess pieces will be making way for entirely different creatures. This is chess from a different planet, we're talking Martian Chess.